May you emerge from the “Black Friday” sales lovlier than ever! 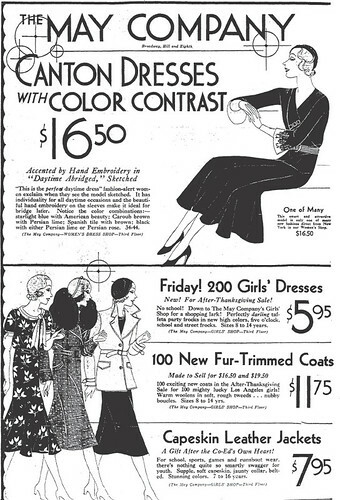 May Company ad - Los Angeles Times - November 26, 1931 --$16.50 = $234.67 in current USD. Holiday parties are just around the corner. 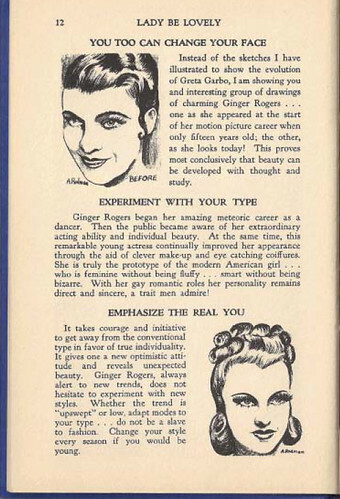 If your face isn’t a perfect oval (few of us are so lucky) and you’re not sure how to identify the best hairstyle or makeup to enhance the shape of your face, watch and learn from this delightful tutorial from the 1940s. Video is courtesy of the Prelinger Archive. Hmm -- I think maybe I'll just have a salad. 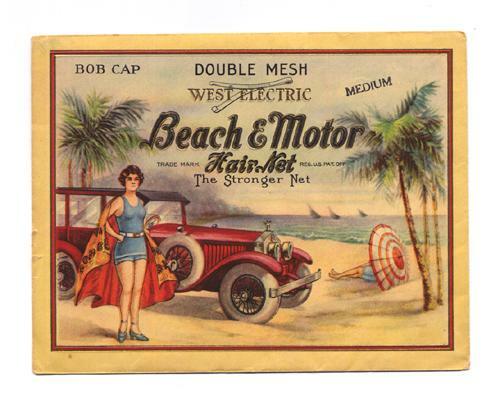 The design on the hairnet package above is emblematic of the 1920s in Southern California: surf, sand, sun and sin. What? You don’t see any sin in the design? 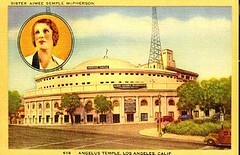 I guess it’s just my evil mind — the first thing that I thought of was Sister Aimee Semple McPherson’s mysterious disappearance from Venice Beach on May 18, 1926. What did her disappearance have to do with sin? Read on. Southern California beaches weren’t just places from which to disappear in the 1920s — they were obviously places to relax (and to wear your prettiest bathing costume.) I was pleasantly surprised to discover a beautiful souvenir folder of Venice Beach which not only shows people enjoying a day at the beach, but echoes the design of the hairnet package. Note the similarities in the coloration and overall design — really quite nice. Aimee was born Aimee Elizabeth Kennedy on October 9, 1890 on a farm in Canada. 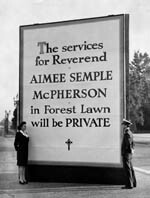 It was her mother, Mildred (Minnie), who first introduced young Aimee to religion. Minnie worked with the Salvation Army and her daughter would often accompany her to soup kitchens. Click on photo to see Sister McPherson preach. While other little girls may have preferred to play house with their dolls, Aimee played “Salvation Army” with hers. Sermonizing to a congregation of dolls may not have been particularly thrilling or rewarding, but it was good practice for her adult life. Given her interest in religion and the fact that, even in high school, she was protesting the teaching of evolution in public schools, it’s no surprise that she fell for a Pentecostal missionary from Ireland, Robert James Semple. 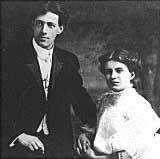 She converted to her husband’s faith and they married on August 12, 1908. The newlyweds immediately took off on an evangelistic tour of Europe. Continuing their mission they arrived in Hong Kong, China in June 1910, where both contracted malaria. Robert died on August 19, 1910 and was buried in Hong Kong. Aimee was just beginning to recover from the same illness that took her husband when she gave birth to a daughter, Roberta Star Semple, on September 17, 1910. Newly widowed and a recent mother, Aimee continued to convalesce in New York, and it was there that she met accountant Harold Stewart McPherson. They were married on May 5, 1912, and their son, Rolf, was born on March 23, 1913. 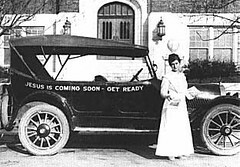 In mid-1915 Aimee took her act on the road and held tent revival meetings up and down the Eastern Seaboard, eventually heading out to other parts of the country. Whatever his reasons, Harold wasn’t always able to travel with his wife and their marriage suffered. In 1918 he filed a petition for divorce (citing abandonment) and the divorce was granted in 1921. Aimee eventually tired of being on the road and settled in Los Angeles. Her ministry was so successful that she was able to build the Angelus Temple in Echo Park (dedicated in 1923). Sister Aimee was at the zenith of her influence and popularity by 1926. And then it all began to unravel. 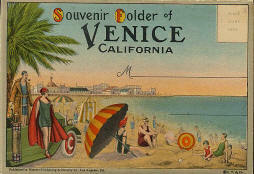 On May 18, 1926 McPherson went with her secretary to Ocean Park Beach, just north of Venice Beach, to swim. It was from there that Aimee vanished. Had she drowned? Her mother thought so. Aimee had been scheduled to preach later that day, but Minnie filled in. She ended her emotional sermon by telling the parishioners that “Sister is with Jesus”. Mourners kept a seaside vigil for their beloved Aimee, but she did not emerge from the sea. Sadly, one parishioner drowned searching for McPherson, and a diver perished from exposure. It didn’t take long for people to notice that Kenneth G. Ormiston, the engineer for Aimee’s radio station, KFSG, had disappeared as well. Some felt that Ormiston and McPherson had run off together — they had become very friendly. A month passed when finally there was word of Aimee in the form of a ransom note delivered to her mother. The note demanded a half million dollars or else McPherson would be sold into “white slavery”. The note was signed “The Avengers”. Believing that her daughter was dead, Minnie tossed the letter. On June 23rd, like a biblical prophet, Aimee staggered out of the desert into a Mexican town just across the border from Douglas, Arizona. Aimee’s story was that she’d been kidnapped, drugged, tortured, and held in a shack until she managed to escape, walking 13 hours to freedom. There were several gaping holes in her story: her shoes were grass stained and showed no signs of a 13 hour desert trek and, furthermore, she’d disappeared from the beach clad only in a bathing suit, yet she had turned up following her abduction fully dressed and wearing her own wristwatch. To make matters worse, no sign of the shack where she was allegedly held was ever discovered. 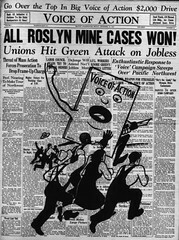 A grand jury convened on July 8, 1926, but they adjourned after 12 days saying they hadn’t enough evidence to proceed against the wandering minister. The Grand Jury reconvened when new evidence was uncovered. The evidence suggested that Aimee and Kenneth had been traveling together, and signing into motels along the way. What had Aimee really been up to for over one month? Had she been kidnapped as she continued to maintain, or had she gone off to have an abortion, or heal from plastic surgery? We’ll probably never know. District Attorney Asa Keyes dropped all of the charges, thus ending any official investigation. 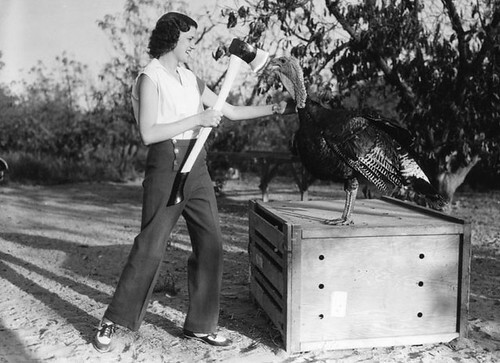 Despite the bad press she’d received Aimee continued her good works, but her reputation had been permanently damaged. Involved in a power struggle with her mother over control of the church, Aimee had a nervous breakdown in 1930. 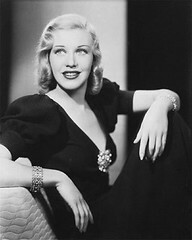 McPherson would marry for a third time on September 13, 1931 to actor and musician David Hutton. Two days into the marriage the groom was sued for alienation of affection by Hazel St. Pierre. Hutton claimed never to have met Hazel, but she still managed to walk away with a settlement of $5,000. Things would get worse. 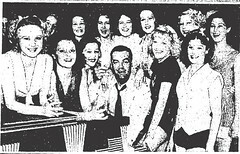 Aimee was in Europe when she heard that Hutton was billing himself as “Aimee’s man” in his cabaret act. Let’s hope he wasn’t performing “The Ballad of Aimee McPherson”. 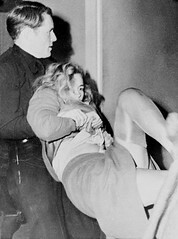 David and Aimee were divorced on March 1, 1934. On September 26, 1944 McPherson traveled to Oakland, California for a series of revivals. When her son went to her hotel room at 10 am the next morning to fetch her for her sermon, he found her unconscious. Aimee would die less than two hours later. The coroner was not able to conclusively determine the casue of death. Apparently Aimee had been taking sleeping pills (Seconal) and it is most likely that her death was the result of an accidental overdose. I wonder if there was something in the air during 1926 that caused two very famous women to mysteriously vanish, and then to reappear without a credible explanation. 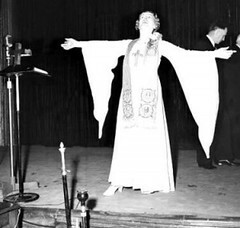 The first woman was, of course, Aimee Semple McPherson — the second woman was famed mystery writer Agatha Christie! 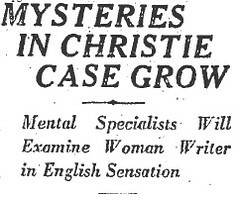 On December 8, 1926 after being told by her husband Archie that he was in love with another woman and wanted a divorce, Agatha vanished. She’d left notes for both her husband and her secretary saying that she was going to Yorkshire. Her car was found abandoned and for a while it appeared that she’d been the victim of foul play. 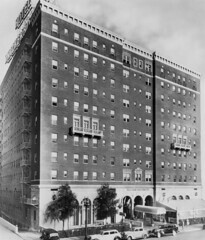 About ten days later Agatha was identified as a guest at the Swan Hydropathic Hotel (now the Old Swan Hotel) in Harrogate. Agatha would never give a full account of her disappearance. Two doctors diagnosed her as suffering from amnesia. I believe it was the news of Archie’s infidelity that caused her to go off the rails for a while. 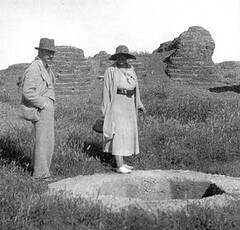 Archie and Agatha would divorce, and in 1930 she would marry an archaeologist Max Mallowan, whom she’d met on a dig in the Middle East. The Mallowans would have a long and happy marriage. For a wonderful fictional account of how Agatha spent her missing days, watch the 1979 film “Agatha” starring Vanessa Redgrave and Dustin Hoffman. The twenties were a time of change, and nothing was changing faster than the attitudes of young women regarding “powder and paint”. 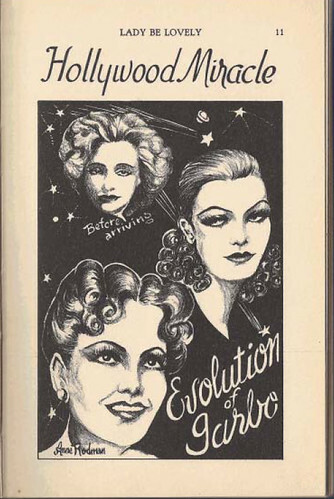 While makeup was never intended to be a political statement, whether or not to use makeup was becoming a highly charged issue for young women during the the 1920s. On the lighter side of the topic I found this story in the Los Angeles Times, dated March 22, 1923. 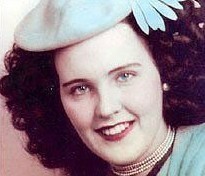 This coming Saturday, November 14, 2009, it will once again be my pleasure to co-host Esotouric’s “The Real Black Dahlia” tour. The tour isn’t so much a “who done it” as it is an exploration of Beth’s last couple of weeks in Los Angeles. 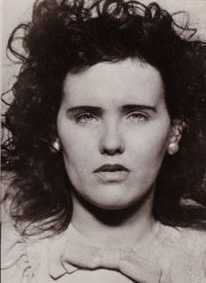 My abiding interest in vintage cosmetics, social history, and crime led me to create a thumbnail sketch of Elizabeth Short’s personality based upon her choice of cosmetics. What was it about Beth’s make-up that set her apart from her contemporaries? Join us on Saturday and find out. 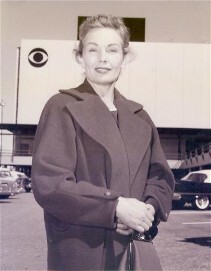 Her make-up selections may have been unusual, but in many ways Beth Short was typical of a certain group of young women characterized as the “Children of the Night” by Caroline Walker in an interview she conducted with Lynn Martin (who had been one of Beth’s roommates in Hollywood). These young women floated from man to man, and occasionally from job to job (they weren’t often employed). 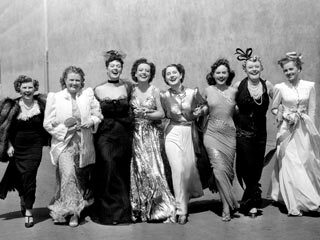 They weren’t prostitutes, they were simply a part of the post-war generation who gravitated to Hollywood for reasons of their own. Maybe they believed what they’d seen in the movies, that Hollywood was glamorous place where a pretty girl could parlay her looks into riches and fame. 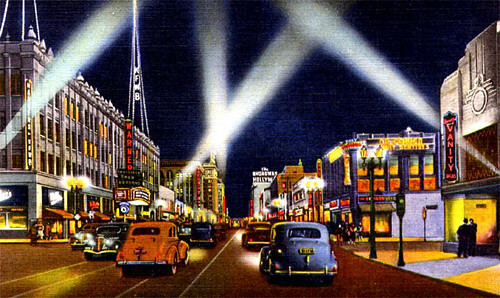 For the rootless young women in Beth’s set Hollywood and downtown Los Angeles were often desperately lonely places offering little more than dark barrooms in which to hang out and wait for a man to buy them a drink and dinner. Any of them could have ended as Beth did — dead and dismembered in a vacant lot in Leimert Park within view of the Hollywood sign. Join us on the tour and learn more about the woman at the heart of Los Angeles’ most infamous unsolved murder. I confess, once I started paging through “Lady, Be Lovely”, I couldn’t wait to post a few more pages from that delightful book. Today we’ll learn, among other things, that beauty has a viewpoint, that the queen of beauty is love, and how to be courageous. 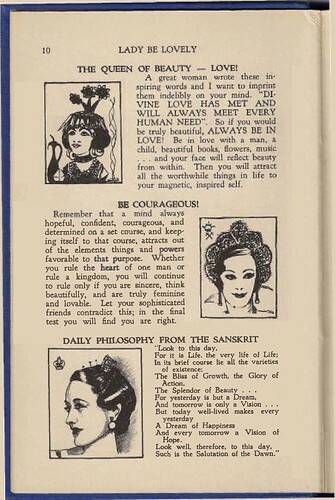 There’s also a quote from the sanskrit, accompanied by a drawing that is obviously Wallis Simpson, the Duchess of Windsor. I will devote more time to the Duchess in a future post on unconventional beauty. 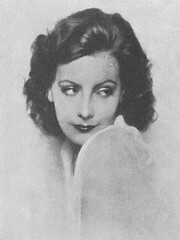 I have an extensive collection of books on every subject of feminine interest from vintage fashion to cosmetics. 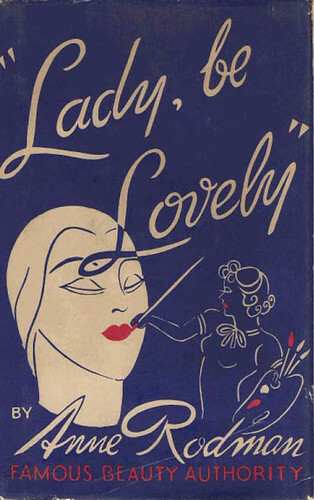 One of my favorites is “Lady, be Lovely” by Anne Rodman, published in 1939. 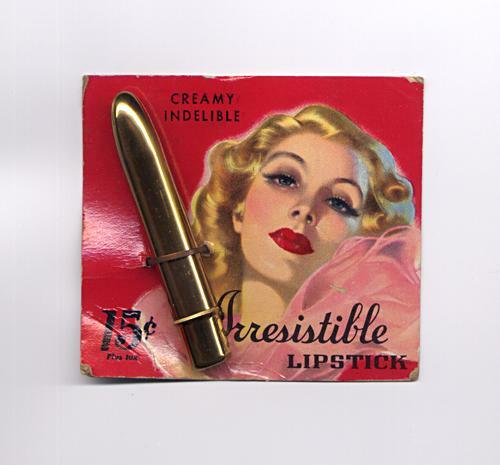 According to the introduction Anne worked as a copy writer for some of the leading cosmetics firms in the U.S. She also had a background in commercial art. 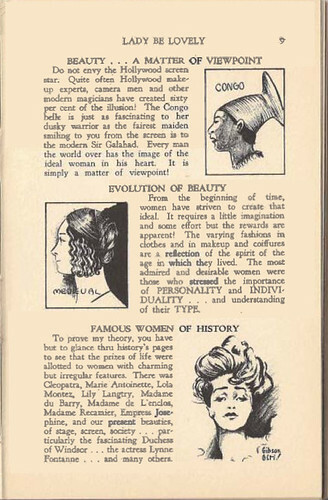 Taking as her inspiration the notion that beauty could be taught to women from the viewpoint of an artist, she began to create “before and after” cartoons so that “a woman could see at a glance how to improve her appearance, just as if she were seated before the mirror of the best salon expert on Fifth Avenue.” What a wonderful concept! Anne Rodman’s book reminds me of the film “The Women“. Both the book and the film were released in 1939 and each deals in its own way exclusively with women. The film was based upon a play by Claire Booth Luce, and was adapted for the screen by Anita Loos and Jane Murfin. The sets were glorious — designed by Cedric Gibbons; and the women themselves were utterly divine — dressed by Adrian. 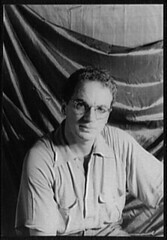 Adrian’s designs were highlighted in a Technicolor fashion show sequence which was frequently cut from modern screenings. With the exception of the fashion parade the film was shot in B/W. I would love to have seen Norma Shearer’s famously “Jungle Red” fingernails in color, but that is something left to the imagination. There is a NARS lipstick in Jungle Red that may be fun to try. Because Anne’s book is so delightful, I’m going to share bits of it here on a regular basis. 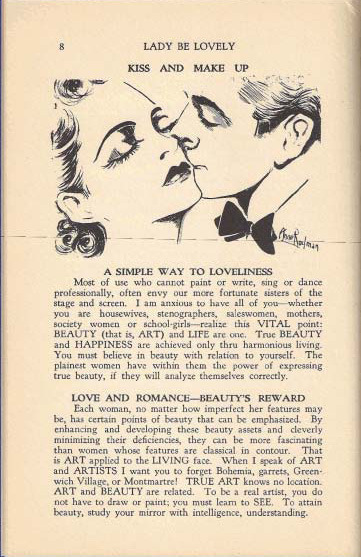 I don’t know about you, but I can always use beauty advice, even if it is 70 years old! Get ready to “Kiss and Make Up” — the topic which begins Rodman’s book.